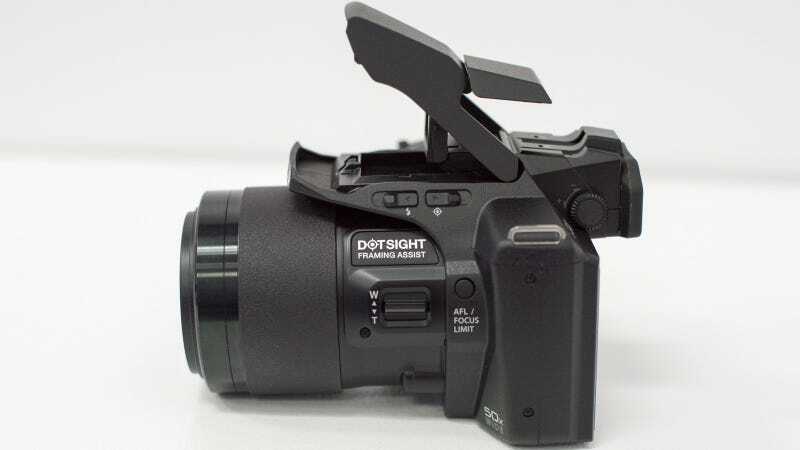 If point-and-shoot cameras have a future it's all about zoom, and Olympus just innovated the super long super zooms with a badly needed addition we didn't even know they needed: A red dot zoom like a sniper rifle. That sounds horrible and murderous, but it's really just good for killing photos. Here's the problem: Really long optical zooms have gotten very good—good enough that compact super zooms just seem to be getting zoomier and zoomier by the yearly iteration. The problem is that we you're all the way in at 50x magnification, it's hard to tell where exactly your camera is pointed. It's funny that all of those trees seem to look the same when you're looking at only leaves! The new red dot sight on the SP-100 is a lifesaver for all the photographically challenged people you barely know how to operate a camera, let alone one with an absurd zoom capability. Simply pop up the flash and loo through the little glass area below the flash and you'l see a crosshair sight that'll give you an idea about where the centermost area in the lens is pointing. So simple, and yet so useful.